The one touch searchable PDF feature helps you to save the documents in the specified storage location and later on when you require the documents, and you can retrieve them all but just keying the initials of the documents. Or simply type any keyword you remember of the document you want to find to bring up all relevant documents. The function buttons are customizable to enhance productivity and to save a lot of time for you. You can scan the documents and save them in various file formats by just clicking the button. The front office executives or the accounts department take huge number of documents and scan them for their official use but later on it becomes difficult to retrieve the documents from the large pool of documents. This scanner features full color duplex scanning of “thick documents” and “plastic card”, such as insurance cards, credit cards, ID card and drivers licenses. 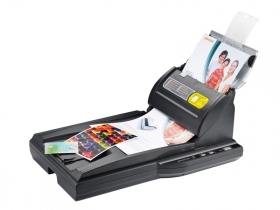 Owning to its sheet-fed and flat-bed functionality, this scanner actually enhances the speed and manages the document scanning very cleverly. As the finance department requires scanning of batches of documents, the executive can use sheet-fed scanner to scan the documents and save them automatically. After you start batch scanning, you need not have to monitor the machine. You can utilize that time for other activities till the entire scanning ends. In fact, organizations keep documents from customers such as receipts, tax refund or application forms for various purposes. Year on year these documents pile up and take large space but with this scanner, you can convert the physical documents into digital files and store them or mail them to the designated people or organizations. Your organization even can upload all the documents to a FTP site and send link to the customers or share among the colleagues for internal use. It is much easier with this scanner to share documents now. And, the biggest aspect is that it is green by design as it does not require any warm-up time. The flat bed scanner, on the other hand, helps the users to scan the documents which are not in batches. Single papers, hand written documents or messages or phone numbers written on small piece of papers can be scanned quickly and sent or saved to the defined location. This means you can create the office completely paperless.